At one time engagement and wedding ring designs were pretty standard; a simple band and a perhaps a diamond, and there it was. Luckily, wedding jewelry has come a long way since the days of old. The bride and groom can now choose from countless materials and a myriad of styles. 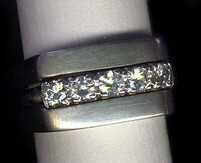 Custom rings have also become much more common (and affordable) in recent years. Object Fetish is a great place to find some unique engagement and wedding rings if you are one of those couples who like to stand apart from the crowd and let your individual sense of style shine through. You will find more than simplicity and anything but traditional when you browse their collection. They carry such a wide selection of rings and even offer you the option of having custom rings designed to suit your individuality. I Now Pronounce You, "Tweet of Honor"? Here a Tweet, there a Tweet, everywhere a Tweet-Tweet! Twitter has taken over. Local news reporters, celebrities, bloggers, businesses and many others from just about every walk of life are hoping you will follow them on Twitter. It should be no surprise then that according to a recent press release made by Hitched.co.uk, Twitter is on the forefront of an emerging wedding trend as well. Apparently there is a new role of great importance to fill when selecting your wedding party. Read more about I Now Pronounce You, "Tweet of Honor"? Shoes that won't kill you! 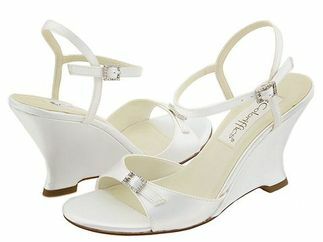 Choosing wedding shoes can be almost as daunting a task as choosing a dress, with one extra factor to consider: comfort. While squeezing into a corset for a few hours is probably something that most brides are willing to do, spending all day and night in high, uncomfortable heels is not. Shoes are a vital part of your wedding ensemble. They affect the way that you walk, the way that you stand and the way that you dance. They can alter your height (you don't want to be towering over the groom in the wedding photos if you wear 3 inch heels) and your posture. So finding comfortable shoes is a must. As most women know though, fashion and comfort seldom go hand in hand. But that said, here are a few ideas for comfortable wedding shoes that are great for any type of wedding. Read more about Shoes that won't kill you! New York is full of rich history and entertaining places to visit, especially where the Gold Coast of Long Island is concerned. One of the most amazing is the Oheka Castle and Estate. Imagine if you will, a historical 109,000 square foot private residence, built in the 1920's era of opulence and entertaining with breathtaking rooms and exquisite decor. Oheka Castle and Estate is the second largest privately owned house ever built in America, and has changed hands many times since it was originally built in the early 1900's by the philanthropist Otto Kahn. As a little girl, I fondly remember playing in my Grandmother's costume jewelry with my cousins. She kept all of the pieces she no longer wore in coffee cans for us girls to "masquerade in", as she called it. We would spend hours rummaging through those cans of jewels and playing every dress up game we could conjure up. I had not given much thought to that in quite a while....no time for reminiscing seems to be penciled into my schedule. However, for a brief moment, I caught myself travelling back in time as I sat browsing through all of the vintage inspired creations Vintage Wedding Jewelry has to offer. It was nice to relive those memories, even if it was just for a moment. Perhaps you have similar memories of your own. Saying wedding favors come in all shapes, sizes and varieties seems to be an understatement these days. There are so many possibilities out there that making a decision can be tough. The good news is that there is no right or wrong, and to be honest, while it may seem vitally important it really isn't the biggest decision that you need to make for your wedding. Your wedding will be beautiful, you will have a day filled with romance and laughter, and your guests will be thrilled to be there celebrating with you, regardless of what token they take away from the day. Everyone has differing tastes and personalities and this is also true for your guests. So while some wedding favors may seem cute or even interesting to you, others may not share your view. The green trend in weddings has me all excited! I have always been 'green' and while that meant spending most of my younger years being considered ahippy or idealistic liberal it is great to see the world finally turning my color. I am constantly finding new websites that offer exciting options for the environmentally aware bride. Apparently this idea is catching on and spreading like wild-fire! This week I stumbled upon Anna Clifton Jewelry and found the "Eco-Flower" Recycled Wedding Tiara, which is made (unbelievably!) from old cans and recycled beads. Living at peace with the Earth and making every possible effort to reduce the effects we have on it, can often include choices many people never even consider. This is especially true where wedding rings are concerned. Jewelry made from recycled precious metals has become quite popular and chic; yet other striking and Eco-friendly options are coming to light. Wooden engagement and wedding rings are quite viable contenders in this category. Just as broken, unwanted metals can be recycled into something shiny and new, so can wood. From a worn out rocking chair to a favorite childhood toy, the possibility of giving new life to wood is not one to overlook. The transformation of old to new combined with a promise to love and cherish are remarkable counterparts if you think about it. Wooden rings can be made from a wide range of recycled materials. I admit that I am a bit of a snob. I love luxury. I only tend to travel once a year, and only for a few days, but believe me, I can blow most people's two week family budget in a short but fabulously indulgent weekend. Allow me to present one of my top luxury locations on the West Coast... If a warm and sunny coastal wedding destination is what your dreams are made of, then The Cliffs Resort in California's new wine country may be just the place for you. With the sun's comforting rays, the soothing lap of the Pacific Ocean's waves crashing softly along the beach and all of the sophistication befitting royalty, this romantic location is perfect. Going green does not have to result in forsaking style or luxury at your wedding. Au contraire! A number of companies specialize in offering couples a wide range of green (as in saving the planet, not the color) favors. And don't think it is all rose petals and home made bath bombs. Nope, the green movement has swept over every area of the wedding industry and you can find a favor to suit any budget or style of wedding. In fact, the available selections may make choosing just one particular favor a little on the difficult side. With the growing concern toward the effects our daily living has on the environment, many people are constantly in search of ways to limit the amount of havoc being wreaked on our planet. Efforts to reduce, reuse and recycle are among the priorities added to our daily to do lists. In addition to our own personal efforts, we must also consider industrial efforts.